Our Office Transition Service Team is the authority on office furniture delivery, installation and seamless office transitions. 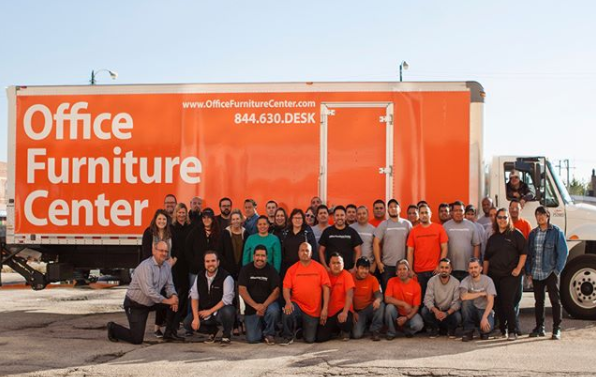 Office Furniture Center operates the largest showroom of value-priced office furniture in the Midwest. Over the past 10 years we’ve served over 25,000 customers. We specialize in premium pre-owned office furniture at a fraction of the cost of new. We also refurbish office furniture so you can customize the colors and textures to meet your needs and budget. Office Furniture Center is committed to successfully implementing large, complex and often multi-faceted office transition projects. Our service team plays a critical role in overseeing the detail of the office transitions so our clients can focus on their businesses. We act as a liaison between vendors, subcontractors, and internal personnel to ensure that all aspects of the project are handled with priority and professionalism. The administration of this division is handled by MAC Logistics. To visit their website click here. Our transition specialists will tour your office environment, speak with key employees and diagram your workflow, all in an effort to understand your workspace requirements, including general specifications, office space design and IT needs.